One of my older, popular posts is from 2010 and talks about how to run a one-person or new HR department. I wrote it after attending a conference session on the topic, but at the time I had never been in a small or new HR department before. Now I have that experience and would like to share. I also realized that a very close tie-in is the group of HR professionals who have had to start the HR function from scratch (whether in a new company or an existing one), and I think this article is going to be very helpful for both of those groups. In addition, there are amazing ideas included here for HR pros who feel like there’s just not enough time in the day to get everything accomplished (who out there can’t claim that one?). You’ll learn how to juggle multiple competing priorities and make the biggest impact with the fewest actions. You’ll learn how to balance the needs of an executive team with those of your staff, and I’m willing to bet you’ll take away a heck of a lot more. Note: I have included more information in this article than some of the eBooks I’ve published(!). I plan to combine this information into a free PDF guide to share on the blog if there is any interest in that. There was just too much great content to cut any out, and I don’t want to shortchange those who took the time to share their ideas with us. Enjoy! Check out the chart below. Click the image to make it larger. I had no preconceived notions about which area was the most critical, so I was surprised to see that developing alliances/partnerships made the top of the list of priorities. I’ve emphasized that in my roles for several years now, and I believe it has helped to shore up areas of weakness and provided invaluable networking opportunities as well. I think legislative/legal updates fell to the bottom due to the “fun factor” (or lack thereof). It’s still going to get done, but we don’t have to like it. :-) To be honest, this felt like an unfair survey, because all of these are key areas to focus on; however, I was interested in finding out what others thought about which one made it to the top of the list. Any surprises here for the rest of you? I’m a relative newbie to this world, but I know it’s where I was meant to be. What makes a small or new HR department different from other companies? We don’t pick up the phone and call our corporate HR team. We ARE the corporate HR team. We are comfortable with research and making judgement calls. We constantly seek out opportunities for professional development–if you’re not growing you’re dying. There are certainly more, but those three quickly jumped to mind. What was the purpose for creating this new department? Who made the decision? Who is going to support you as you learn about the organization and its key players? 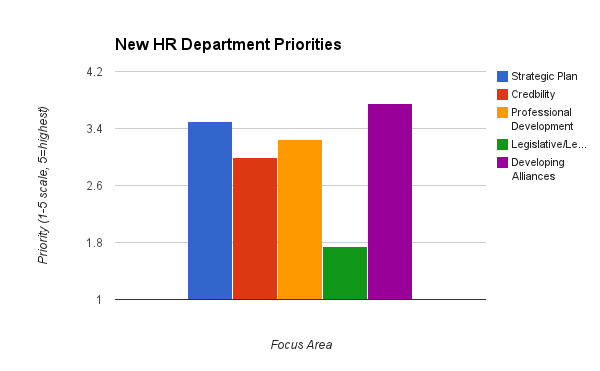 What HR activities were being done previously and who was doing them? What sort of culture exists? Do the leaders and staff have the same view of the culture? I had an amazing mentor, but like I said, I feel like I’m wired for this kind of stuff. I love the challenge and bouncing around to the different areas of HR on an hourly basis. There’s no substitute! After doing a little research, I read this book last year and it had some great ideas and advice. 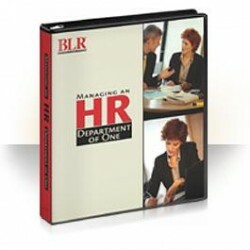 It’s been around for a while and still makes the bestseller lists in the SHRM bookstore regularly. I admit that it’s pricey if you look at it only as a book; however, it’s much cheaper than a 6 hour study course plus travel costs to get the same content, so keep that in mind. I posted this short slidedeck on Slideshare as a way to share some of the ideas beyond the blog. It’s a “highlights reel” of the content and I hope it helps some people who otherwise would not find this article. If you’re waiting for the good stuff, skip down to the next section and you can get some tips and advice from people who do this stuff on a daily basis! I reached out to a few people I trust and also opened up a short survey for a handful of people who are (or have been) in this scenario before. Below you’ll see how real HR pros have confronted and overcome the obstacles facing someone in a new or small HR department. Note: I want to apologize to anyone who submitted comments that were not included here. I had an overwhelming number of responses and had to limit myself to sharing the first few people who responded. As I said above, I plan to put this together into a free PDF so that anyone can read, print, or share the information. Look for that coming soon! Richard wrote a monster of a contribution. I had to pull out some of the content for space reasons, but I have his entire piece linked here if you want to check that out. It’s phenomenal and worth your time to read if you truly want the advice of a guy who’s “been there, done that.” Here’s the extremely shortened version. Be sure to read the full piece or you’ll miss the good stuff. If you are setting up a brand-new HR department, or you are taking on one all on your own, build your plans for immediate impact projects, short-term (within the quarter) projects, and long-term projects. HR project management is serious stuff. Your plans WILL be disrupted. Constantly. Build that into your timeline. Don’t underestimate how much information your employees want. If you are a soloist, and especially if you are relatively new to employment laws, make yourself a binder (electronic or hard-copy) of the most up-to-date info on the basics (FMLA, FLSA, ADA, and if you handle benefits, COBRA). Do your best to not become the “office cop” – the hardest role you have is to watch out for things that can get the company (and people) in trouble without being the person that everyone avoids. And finally, the top three skills you should use on a daily basis: talk, listen, and learn. Again, (I’ll say it one more time) check out the full content if you haven’t already so you don’t miss any of the details on how to implement this yourself. Thanks again to Richard Sherman for pitching in and offering some great advice! Brian shared some very intriguing ideas for outsourcing the majority of the “HR” work to allow a small team to handle the critical roles of the HR function. I don’t know that I agree with all of Brian’s comments, but then again I’ve never been in a crunch tight enough to have to seriously evaluate something like this. It’s an interesting proposition if nothing else! I would try to “outsource” process driven activities to as many internal partners as possible. Payroll is likely already housed within Finance; perhaps open enrollment and qualifying life events could be something they tackle as well (the counseling portion still resides with HR). Recruitment, orientation and onboarding? Give it to Marketing who can polish what you are selling to potential candidates and new employees. Compensation is driven by numbers and spreadsheets; pull in someone from Accounting. Training may be best handled by line supervisors and tenured employees. Employee Relations can be farmed out to Legal. Make sure to visit with each manager and ask them what HR can do for them to help make their job easier. Learn everything you can about the business and ask to be included instead of waiting around to be asked to do something (you end up being a paper pusher or sheriff if you don’t). In a small to non-existent HR department, strategy, talent, etc. isn’t important. Most of the company is flying by the seat of its pants. What is needed is benefits, knowledge of applicable laws, processes and procedures (performance reviews, requesting vacation time, requesting sick time, etc. ), and guts. The HR person has to have the guts to go to the company president and say “You can’t do that,” and be prepared to hear, “Sure I can; I own the company.” Then you have to dig your heels in and insist. Then you go back to your office, hold your breath and hope you didn’t just sign your own termination. Expand your network of HR professionals. These are the people you can call on to bounce ideas around, vent, etc. Smile before you pick up the phone to say hello. You will be the point person for many questions such as insurance, retirement, pay, etc. We all have had the one employee who has gotten on our last nerve, but always remember that without the employees you would not be needed. Smile before you pick up the phone and you will automatically position yourself to be in a better mood to deal with the annoying employee. Enjoy what you do. If you don’t, move on. Below you’ll find a few links to other helpful resources. I went through several dozen and discarded the ones I felt would not be value-add to this discussion on working in a new HR department. Okay, do you have anything to add? What has (or hasn’t) worked for you? What advice would you give someone starting out in a small or new HR department for the first time? Let’s make this thing even better! This entry was posted in General and tagged Small Business, Strategic HR, Ultimate Guide on January 14, 2013 by Ben. 2.Understanding the processes of each function of an organization but starting with the Operations/Processes for delivering the Product or Service is essential (knowing job descriptions is not enough, participating on a trial basis helps one to somewhat internalize the mindset of employees in other functions). 4.Knowing statistics, econometrics, loads of Excel with VBA, lets one actually analyze performance and check for the impact of any changes in an organization upon the performance of employees. This is interesting, I would like to know more. i am starting in a new company with no HR backround, i will need your assistance. I am Madhumitha S. I am employee of 6i-InfoTech LLP in India(Tamil Nadu). Our company started in 2012 by two members,now they are my CEO and CTO.Recently only they appointed me as Recruiter for the company,before there was no HR team and now too.I suggested them that our company need a HR team and they have accepted. My question is What should I do first???? You see I have no experience or knowledge about HR team and how to start a HR team in our company? Please advice me in this matter.I studied your page and got some ideas.But i need more. please help. Thank you sir.